GATEWAY RECREATION LIQUOR LICENSE WITH OUTDOOR SERVICE AND SUNDAY SALES. 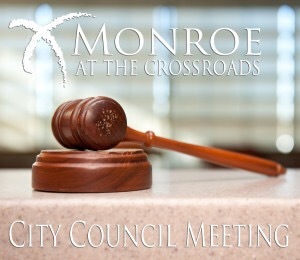 THIRD READING OF THE ORDINANCE AMENDING THE CITY CODE OF THE CITY OF MONROE, IOWA, BY AMENDING SUBSECTION 136.08 OF CHAPTER 136 CONCERNING THE CONSTRUCTION OF SIDEWALKS AND DRIVEWAY ENTRANCES ON NEW RESIDENTIAL HOMES. SET DATE FOR BID LETTING FOR THE WEST LINCOLN STREET PROJECT AND APPROVAL OF RESOLUTION FOR TAKING OF BIDS FOR THE WEST LINCOLN STREET IMPROVEMENTS. DISCUSSION AND POSSIBLE ACTION ON A RESOLUTION TO PROVIDE NOTICE OF HEARING ON PROPOSED PLANS, SPECIFICATIONS, FORM OF CONTRACT AN ESTIMATE OF COSTS FOR THE WASTEWATER TREATMENT FACILITY IMPROVEMENT, AND THE TAKING OF BIDS. MATTHEW STOFFEL, PFM FINANCIAL ON FINANCING OF THE WASTEWATER TREATMENT IMPROVEMENTS. SET HEARING DATE FOR FISCAL YEAR 2020 BUDGET. PUBLIC HEARING FOR HJORTSHOJ ANNEXATION REQUEST. CONSIDER RESOLUTION APPROVING HJORTSHOJ ANNEXATION REQUEST. SET DATE FOR PUBLIC HEARING FOR UPDATES TO THE MONROE URBAN RENEWAL PLAN TO INCLUDE THE MONROE DOWNTOWN REVITALIZATION PROGRAM. RESOLUTION APPROVING BUDGET TRANSFERS FOR FISCAL YEAR 2019 BUDGET. CONSIDER MOWING OF CEMETERY AND CONSIDERATION OF MOWING OPTIONS FROM SNYDER LANDSCAPING AND LAWN CARE. HIRING OF GENERAL MAINTENANCE EMPLOYEE. HIRING TO FILL VACANCY FOR MONROE POLICE DEPARTMENT. COPIER PURCHASE FOR CITY HALL. ADA – IF ANYONE WISHING TO ATTEND THE MEETING THAT REQUIRES SPECIAL ASSISTANCE IN BEING ABLE TO PARTICIPATE IN THIS MEETING, PLEASE ADVISE CITY HALL OF YOUR NEEDS WITHIN 48 HOURS OF THE MEETING.